Ultramarine Blue is such a bright and lovely color. 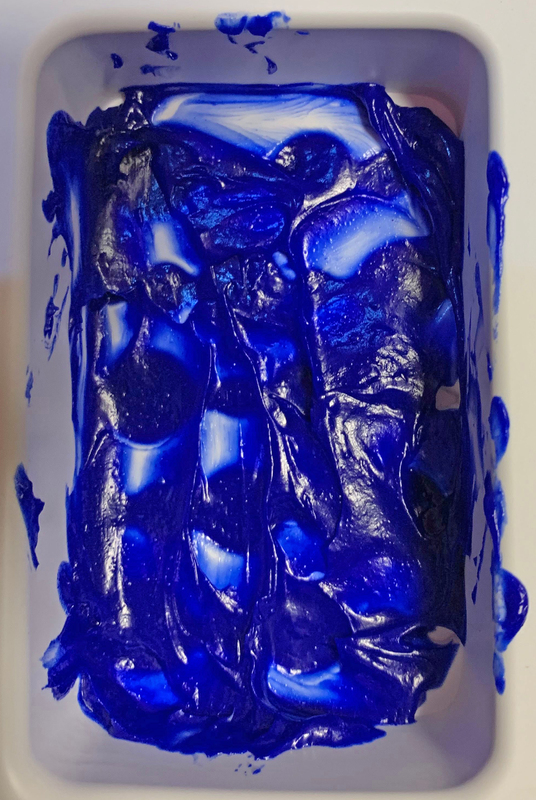 I’m excited to make a soap that combines this blue pigment with the delectable scent of Blueberry Bliss Fragrance Oil. The blue was exactly the color I was looking for, but the soap wasn’t! I have a random soap mold in my collection that has dots in rows at the bottom (which becomes the top of the soap). 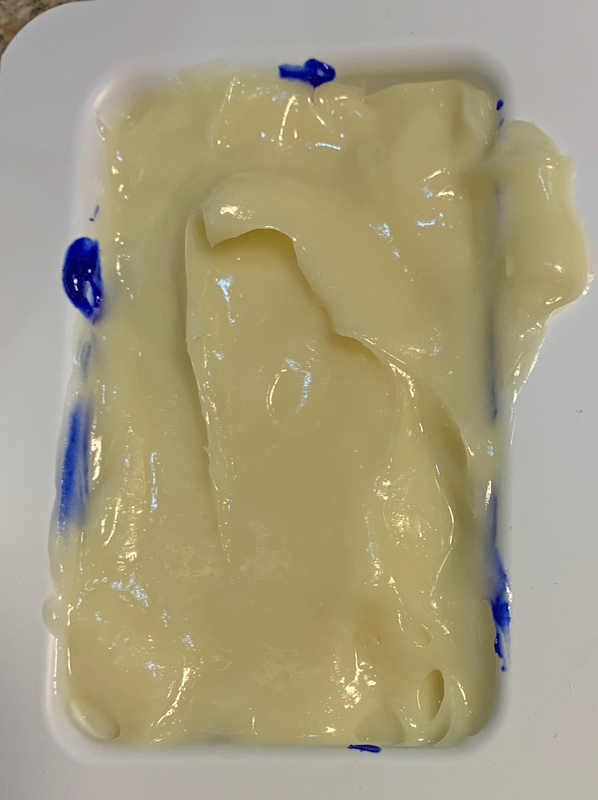 I had the idea to color a small amount of my soap batter a deep blue and use a transfer pipette to fill the indentations. After filling the dots, I would pour the uncolored soap batter over the blue soap. My goal is to achieve a bar of soap with blue dots representing blueberries! This was the same soap that had caused my earlier disaster (if you missed that post, check it out here), so I was cautious. I cooled the oil mixture to 96 degrees before mixing in the lye solution, which was 84 degrees. I stirred and pulsed with the stick blender to reach light trace, then I added 0.6 ounces of my fragrance oil. (Unfortunately, that’s all that remained in the bottle after the train wreck soap.) At that point, I noticed the batter was much thicker than optimal for pouring or doing anything really but plopping into a mold and hoping it didn’t create air pockets. But I went ahead and tried my plan. The batter was too thick to use the pipette, so I quickly switched to using a spoon to put the blue batter into the molds and just spreading it around. Then I plopped the uncolored batter on top and did my best to smooth it. It will not create the effect I wanted, but I wanted to see how it looked anyway. Now I have a problem to solve with a batter that traces more quickly than I like. superfat you want in your batch. I was not entirely sure why the trace was accelerated, so I asked our technical support team for their thoughts. My concern is that using the Beard & Hair Oil Base as a substitute for the Shea Butter I usually use created a faster trace, as the Beard & Hair Oil Base contains Jojoba Oil. Milk and lye mixture in one cup, melted oils in the other. Lye mixture is 86 degrees; oils are at 96 degrees. 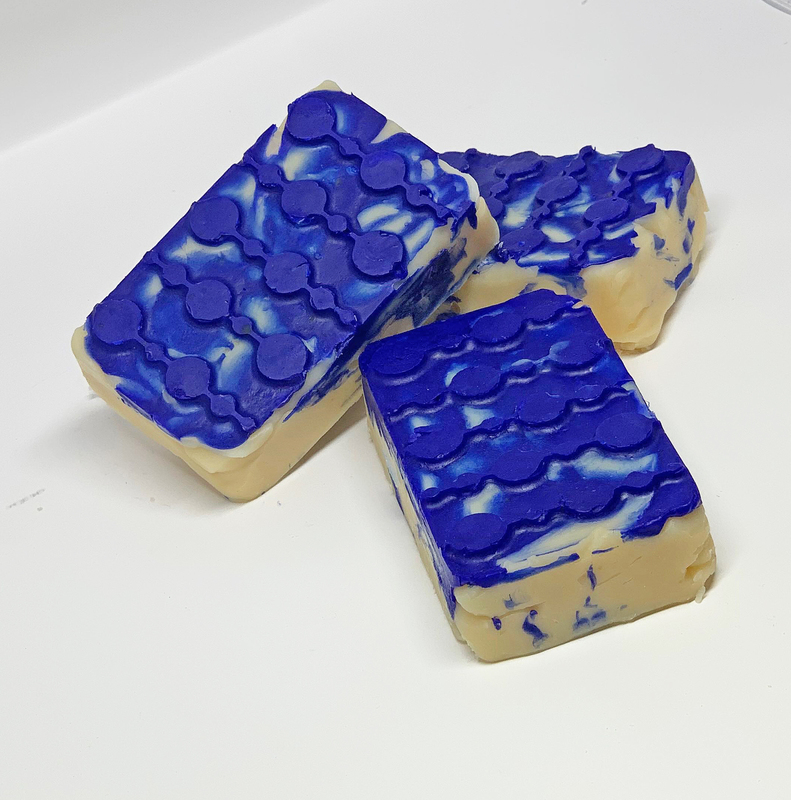 Trying to fill my mold with the blue soap. You can see how thick the soap batter is. It would be great for making designs on the top of a soap poured into a different mold! Not what I wanted in this case, though. My suspicion was confirmed when I heard from technical support. You must soap at or below 100 degrees with Jojoba Oil, which is very temperature sensitive and can cause soap to accelerate to trace. The tip they shared is to hold Jojoba Oil (or any blend with Jojoba Oil in it) out of the initial oils that are melted together. Combine the other oils and lye, and stir to light trace. Then add a little water to the batter and add the jojoba oil. That will keep the soap from accelerating as much. 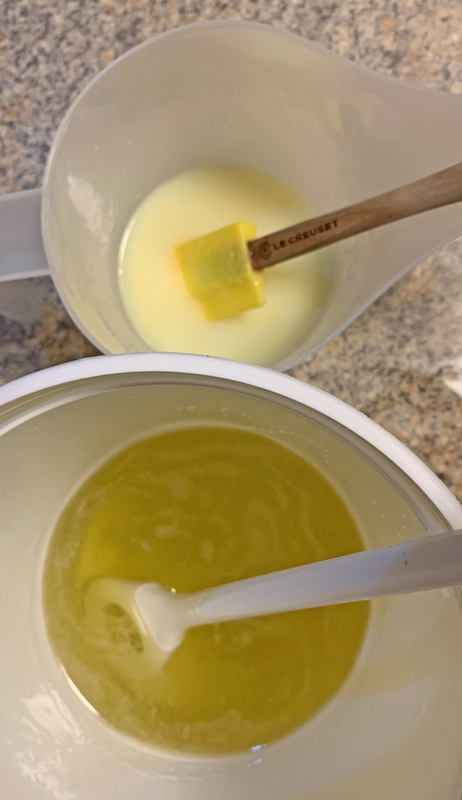 This is an excellent example of how making one small change to a soap recipe can cause it to act very differently than usual. Even after two days in the mold, I had a tough time getting the soap out intact because the bars were still so soft. After 5 days of curing, they remain soft. I bet it will be a lovely soap when it’s finally cured! Isn’t it great that no matter how ugly the design turns out, the soap is still totally usable?! I hope this experience helps someone else, and I’m back to the drawing board and my usual soap recipe for another attempt at Wild About Blueberries, this time using a recipe I am confident will not trace quickly. I think I should do some type of swirl as well. Tune in to find out how take 2 comes together! What have you learned from mistakes that made you a better soaper?